Three years ago, honeyberries (also known as honeyberries or blue honeysuckle berries) literally stole my heart and seduced my taste buds. Each year, I can’t wait to renew this taste-sensation pleasure. If all goes well, honeyberries will be available around St-Jean-Baptiste Day, under the brand name Les Artisans des Saveurs, in many IGA supermarkets across the province. You can also pick your own. Visit the Quebec honeyberry producers association website, Camerise Québec, to find a pick-your-own location near you. While the history of honeyberries in Quebec is young, the Japanese has been well acquainted with it for centuries. In the wake of hybridization work, particularly work done at the University of Saskatchewan, cultivation of this small blue berry has grown exponentially in Quebec since 2007. And, because honeyberries are tough and very resistant to disease, they can easily be grown without pesticides or other chemical additives. Though they have a funny shape, honeyberries aren’t genetically modified. Rather, they’re the fruit of cross-pollination between wild plants. Known as “camerise” in French, “haskap” means “berry of long life and good vision” in Japanese. According to scientific studies, some honeyberry varieties contain more antioxidants than many other small berries such as blueberries, raspberries, blackberries and strawberries. 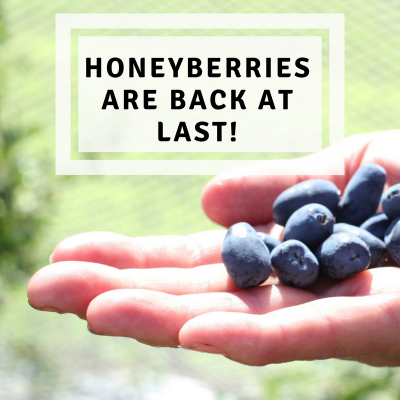 Honeyberries also set themselves apart thanks to their higher phenolic compound concentration, especially flavonoids, which are substances known to help prevent many chronic diseases such as cancer and cardiovascular and neurodegenerative diseases. In the kitchen, honeyberries can be used in smoothies, muffins, scones, salads, dressings, mousses, sauces, pies, puddings, etc. Check out the RECIPE section for inspiration! From entrées to desserts, honeyberries offer a taste everyone loves! I never get tired of making my Blue Honeyberry and Chia Seed Jam. Quick and easy to make, it adds the perfect touch to plain yogurt and also tastes great spread on toast or served with grilled chicken. Each year, when my stock of frozen honeyberries runs out, I tell myself that I should have bought and frozen more of them. So, this year, I’m going to make more room for them in my freezer, so I won’t run out of them in January. I recommend you do the same!